Water is the most common extinguishing agent for combating fires. Water is so fundamental to firefighting that a good water supply is one of the most important factors in municipal fire protection. In many cases, fire protection water storage tanks provide the water necessary for fire suppression purposes inside the building, such as sprinkler and standpipe systems. Sometimes it is not possible to supply the required flow rate or volume of water for firefighting purposes from the public water supply. These circumstances call for the use of a fire water storage tank. No matter the application, all water supply systems must first have a storage capability, and Highland Tank HighDRO® welded steel water storage tanks have been developed to the point where they are now a common sight at many commercial and industrial construction sites, including airfields, airports, schools, universities, hospitals, prisons, police stations, office buildings, data centers, and other facilities that need a reliable or redundant water supply. National Fire Protection Association NFPA® 22 Standard for Water Tanks for Private Fire Protection sets the minimum requirements for the design, construction, installation and maintenance of welded steel water tanks for the storage of water for fire protection systems. Water tanks incorporated in private fire protection systems are those designed to protect individual occupancies from fire. They may be installed in private homes, businesses, manufacturing plants manufacturing plants or public buildings. For tank sizing, a quick rule of thumb is to calculate total sprinkler demand plus hose stream allowance for whatever time requirement there is for the facility in question. Of course, final design and verification by a PE, FPE and local fire marshal is required before proceeding. 3. NSF and AWWA D102 surface preparations and compliant protective linings and coatings. High tech polyurethanes form a hard, inert barrier for both the interior and exterior surfaces of the tank to prevent corrosion. These interior and exterior coatings and interior linings must meet specific site conditions and service requirements. 4. Contain an anti-vortex plate assembly to prevent whirlpool effect from occurring in the tank suction outlet during operation. • Roof or top manways (vertical and horizontal tanks) are used for interior inspection and maintenance. • Two (2) required – 180 degrees apart – 24 inches minimum with catch. • Two (2) required – 30 inches minimum. 6. OSHA-compliant (29 CFR 1910) ladder, stairs, platforms, walkways and railing shall be placed around the roof manholes and other accessories that require top access. Note: The new OSHA rule on personal fall protection systems phases in a requirement for employers to have ladder safety or personal fall arrest systems for fixed ladders that extend more than 24 feet, and phases out the use of cages or wells for fall protection. Additional information on OSHA’s rule on personal fall protection systems can be found at www.osha.gov/walking-workingsurfaces. 7. A properly sized atmospheric vent above the maximum water level. Vent shall have a cross-sectional area equal to a minimum of one-half the area of the discharge pipe(s) or fill pipe, whichever is the larger. The vent shall be designed and constructed to prevent the entrance of birds or animals. 8. A controlling valve at the discharge point. 9. A permanent pipe connected to a water supply to fill the tank in a maximum time of 8 hour. 10. An overflow pipe (no less than 3-inches) of adequate capacity for the operating conditions to prevent over- pressurization at maximum inlet flow. 11. Tank discharge pipe/fire pump connection. It is essential to ensure that this store of water always remains full, so it must have no outlets apart from the ones that lead to the fire pumps. 12. Tank Riser Drain A drain pipe of at least 2 inch must be connected into the tank discharge pipe near its base. 13. Opening Reinforcement for all openings over 4” inches in diameter. 14. Freeze protection systems consisting of steam or electric immersion heaters and insulation for water tanks that are subject to freezing. The heating system must be of such capacity that the temperature of the coldest water in the tank or tank riser, or both, is maintained at or above 42°F during the coldest weather. A low temperature alarm can provide a warning if the water temperature drops below the threshold. 15. A water level monitoring system to gauge and alarm if tank is not at required capacity. 16. Suction screening to insure that the water quality will not impair the fire protection system especially where the water supply is obtained from an open source such as a pond or wet pit. • Live – the weight of all the liquid when it overflows the top of the tank. • Earthquake – tank structures shall comply with the local building code for seismic requirements (AWWA D100 and International Building Code). 18. Anchoring that prevents the unwanted movement of the tank (for anti-floatation or wind/earthquake loading). 19. All tanks and connections shall be tested for tightness to assure proper water supply in the event of a fire. When firefighters arrive at the scene, they need a dependable and ready source of water. 20. AWWA Manual M-42 states: “Tanks need to be operated properly and maintained and inspected on a regular basis to maintain their structural and sanitary integrity”. Maintenance varies depending on water quality, type of tank, type of interior coating and many other factors. At a minimum all tanks should have at least an annual inspection, starting with a simple visual inspection on the outside, and continuing on the inside. Never enter the water storage tank or any enclosed spaces without proper confined space entry training and approved equipment. See OSHA, Regulations for Permit-Required Confined Spaces 29 CFR 1910.146. Highland Tank’s HighDRO® steel water storage tanks have become a vital element within the fire protection system to sustain a building or community’s fire suppression operations. Whether your project involves warehousing, aviation hangars, commercial, institutional or industrial development, Highland Tank’s HighDRO® steel water tanks offer the ideal balance of cost-effectiveness and peak performance. 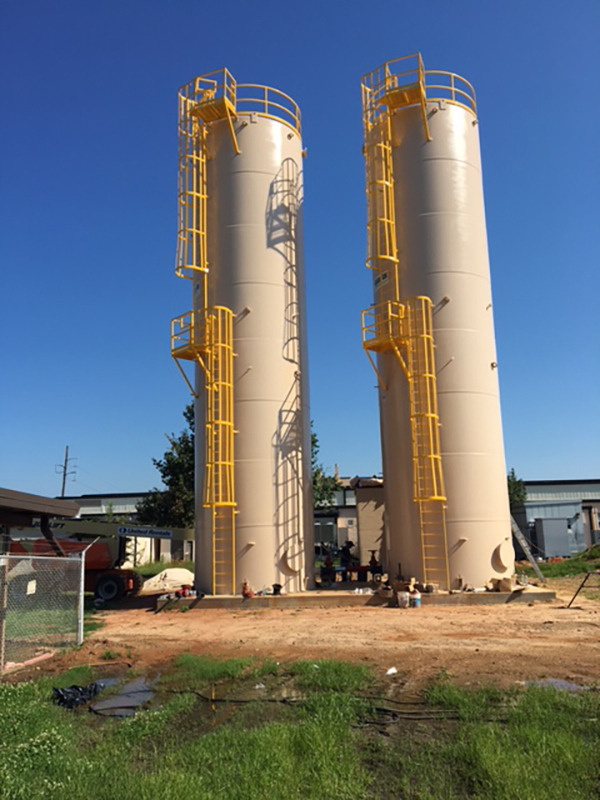 Highland water tanks have various diameter and height options and flexible nozzle locations to meet your projects specific requirements. We are able to engineer a tank according to the required job site specifications by using the latest steel cutting, forming and welding technologies. With our certified welders and our team of expert craftsmen, we can custom-make a HighDRO® steel water tank to suite your needs.